Joyce Harper joined Moore Ingram Johnson & Steele in 1999 as a member of the firm’s Real Estate Department. She specializes in all areas of Real Estate law emphasizing Title Insurance Claims, Underwriting, Quiet Title Actions, Mineral Rights Actions, Boundary and Title Disputes, Title Examination, Commercial Transactions and Closings. Joyce is also a frequent lecturer on CLE for the State Bar of Georgia and Dixie Land Title Association. An Atlanta native, Joyce is a graduate of the University of Georgia and received her J.D. from Woodrow Wilson College of Law. 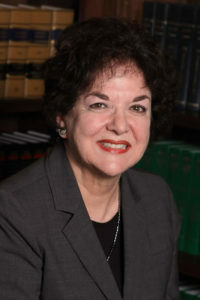 She was admitted to the Georgia Bar in 1982 and is a member of the Real Property Section and the Cobb County Bar Association. Her practice has been in both the private sector and the Title Insurance Industry. In addition, Joyce is also an active member of Commercial Real Estate Women of Atlanta and Georgia Association for Women Lawyers.